The philosophy and philanthropy of the billionaire George Soros, and how it arouses both admiration and intense hostility. 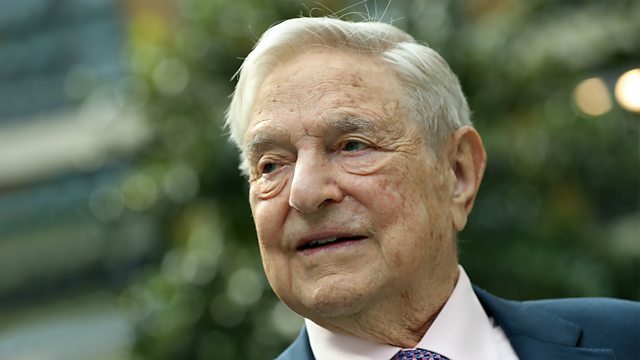 The wealthy investor George Soros first became famous when he made a billion pounds from speculating on Britain's dramatic exit from the ERM in 1992, one of many successful deals that amassed him a fortune and made him one of the world's richest men. But it is what he does with his money politically that brings him enemies. His political commitment and funding has made him the subject of intense hostility from critics in several countries, but a hero to those who support or benefit from his engagement. So how important really is George Soros? Why does he arouse so much venom? Should we be grateful for a billionaire who wants to put his money to social causes? His life and career span the catastrophe of World War 2 through attempts to create a more cooperative world order and the current challenges from nationalists and populists around the globe. Allan Little looks at the making of the man and his way of thought, and the reaction to his involvement in political and civic organisations in many countries.